The word Psychosomatic…is used to refer to the connection between psycho (the mind) and soma (the body). This book is based on a third and most important ingredient to personal wholeness and success. That ingredient is the Spirit. The Spirit is what glues the mind and body together. Without a Spiritual dimension a person is missing a vital component to their personal development. 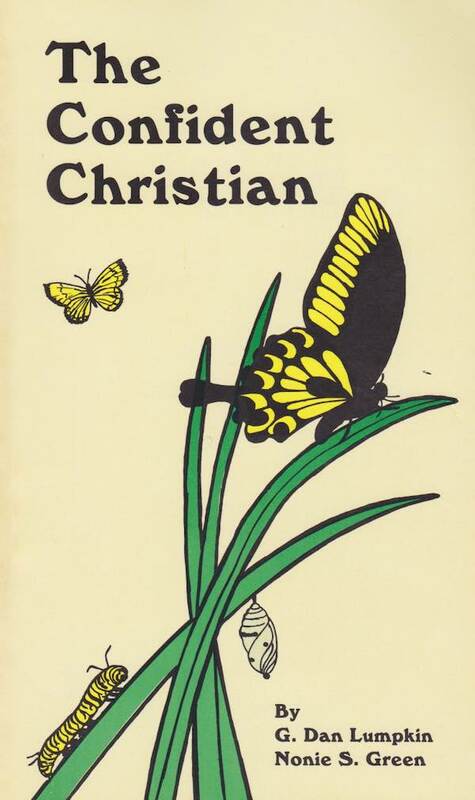 The Confident Christian, originally published in 1984 is now in its second printing! Thousands of people have enjoyed the thoughtful insights provided in this book. Written by G. Dan Lumpkin and his friend and mentor Nonie S. Green, The Confident Christian examines the ingredients necessary for a balanced life in all three dimensions. A professional walk requires a “calling”. A strong motivational movement inside us all that motivates us to achieve professional success. At the heart of every professional success is a personal “calling” to serve and to leave the world in a little better condition that it was when we found it. Answering such a call takes courage, to stand up as a true believer, determination to put the most important relationship in your life at the top of the heap and confidence that your life is not accidental but is truly purposeful. Thousands have found this book practical, helpful and insightful. It is insight into the core philosophy of Dan and Nonie as they have addressed personal and professional issues of thousands of people around the world. You will find it helpful too. A norm is to a group as a habit is to an individual. This survey instrument includes over 80 questions that will allow your people to provide valuable insight into the current workplace norms in your company or organization. The use of the workplace norms survey is vital in organizations experiencing the stress of change and desiring to improve the current situation of their people. Feedback is provided which ranks the most important issues in the workplace from those that need immediate attention to those that are clear strengths of the organization. Designed by G. Dan Lumpkin and used by thousands, this instrument has been the foundational first step in positive culture change. Assertiveness is the degree to which others perceive you to “get your way” by asking or telling. Responsiveness is the degree to which others perceive you to manage emotions by controlling them or showing them. Versatility is the perception that others have of your willingness to manage your behavior so as to make them more comfortable with you. These dimensions of behavior go together to make your personal style. This instrument used in conjunction with our Interpersonal Skills program will is helpful insight into your style and the style of others . Many of our clients use the profiling process for key employees, customers and others in preparation from future business transactions. Lumpkin & Associates has provided 360¡ feedback systems for companies for over ten years. These programs vary based on the kind of performance level and information you wish to provide your leadership team. They are designed to tell the recipient what they should do more of and less of in effectively improving as a manager. Feedback is designed in a specific strategic format for performance improvement by the recipient and is personalized for their specific group or area. It can be statistically grouped by division, department and company so as to provide insight into the company at large. Today many organizations are discovering the world of Self-Directed Work Teams. Many are attempting to move to “teams” without measuring the readiness of the group for team work and/or deciding what the members will need in terms of knowledge, skills or abilities to be the kind of team that is needed. Lumpkin & Associates has a family of instruments that are used to determine the current situation of a work culture and to prepare a vital strategy for moving your organization toward a team environment or repairing a failed attempt to do so. The most widely used personality inventory in history for making important personal and career decisions. They help you improve work, personal relationship, increase productivity, and identify personal, career and leadership communication preferences. The basic career planning tool for anyone searching for a career or career path in an organization. Widely used in career development programs for corporate clients and in outsourcing and career centers set up and operated by Lumpkin & Associates teams. Lumpkin & Associates is affiliated with a network of Psychologists in over 60 major cities that can provide personal and group assessment tailored to fit your organizational needs. We can provide individual and group assessments from psychological testing and evaluation to organizational capabilities. We have found there are certain factors that are critical to your success with your particular customers. An essential step in developing a truly “customer focused” organization is to monitor front line operations through the eyes of the Customer (or potential Customer). Much like the electronic navigational device, our C.P.S. or CUSTOMER PERCEPTION SURVEYS show where your Customer satisfaction levels are now and helps guide you where you want to go. Our philosophy is to recognize and celebrate the good behavior of your team while identifying situations that need to be corrected. Many of the models and diagrams used in Dan’s speeches are available upon request for you to use in your handouts. Two of the most requested models are the Job Burnout Test and The Pinch Model. Feel free to contact us regarding the handout copy or diagram you are interested in. Check out the new social style quick profile. For more that twenty years Lumpkin & Associates professionals have been preferred developers and deliverers of customized training solutions where our clients have needs. In addition to the customized development, we also re-design existing training programs to meet the current business climates. We believe as Dan Lumpkin has said, ” You don’t train your way out of a problem you managed your way into” . However, when training is called for, our technical expertise backed by professional experience and education many industries, makes our facilitating and teaching experience among the very best available today. Dan Lumpkin is a professional member of the National Speakers Association, listed in Who’s Who in Professional Speaking. He speaks to thousands of people around the world on a variety of topics about human behavior in business. While many speakers give the same speech and change audiences, Dan fits his material to the client’s specific need and timeline. An internationally recognized speaker, author and trainer, Dan’s presentations book up months in advance and he is often reviewed as a pioneer of a speaking style known as “edutainment”. Dan makes learning fun. He is available for Keynote Addresses, Seminars, Workshops and any program where you are looking for a quality message that inspires, motivates, develops and entertains. The most frequently requested topics he speaks on are found on the speeches/seminar page. To place and order or get more information on any of our products you may e-mail us or contact us by various other means. Thank you for your interest in Lumpkin & Associates.